Maisie’s ”robber godmother”, the writer Kaija Robberson, is being married. Kaija and Hannes plan to hold their wedding in Lapland. The Robbersons agree to meet with the Tundra Doom robber gang while there, for they hold the very last heraldic syllable needed to open the Robbers’ Handbook. In true Scandinavian spirit, Maisie becomes a modern-day Ronia the Robbers’ Daughter. 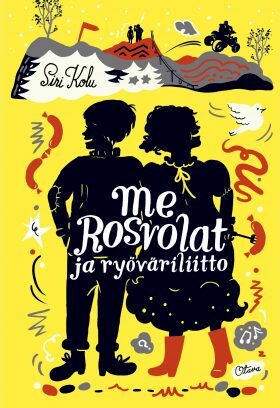 Me and the Robbertsons is a brilliant, topsy-turvy, humorous book full of suprising twists and turns and sparkling with imagination. Every page is a joy to read.